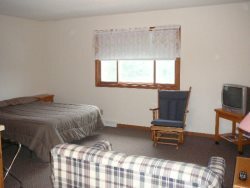 This large one-bedroom, one-bath cabin has been recently remodeled and offers a modern, comfortable feel! The living room features a free-standing gas fireplace, pull-out double sleeper, twin sleeper and beautiful views of the lake. The kitchen is fully equipped with new appliances. The bedroom offers a double bed. Outside, you will find a large lakeside deck with table and plenty of chairs, a picnic table and charcoal grill. Other amenities include great wi-fi reception and close proximity to beach area and piers.